Demetria Verduci, one of our veteran Italian hosts, has organized her Slow Art Day this year to include a marvelous tribute to our trademark symbol, the turtle. Demetria is director of La Macina di San Cresci, an artists’ residence program in Greve in Chianti. From nature to myth, from heraldry to art, from literature to esotericism, from science to superstition, the turtle is an animal full of charm and mystery. It has always been a symbol not only of proverbial slowness, but also of prudence and wisdom, of strength and longevity, of the passage of time, of strength in his indestructible armor opposed to the softness of his body. Slow Art Day, which every year, at the same time around the world, gives life to events related to art and culture in museums, galleries and the most varied spaces, not surprisingly adopted the symbol of a turtle. 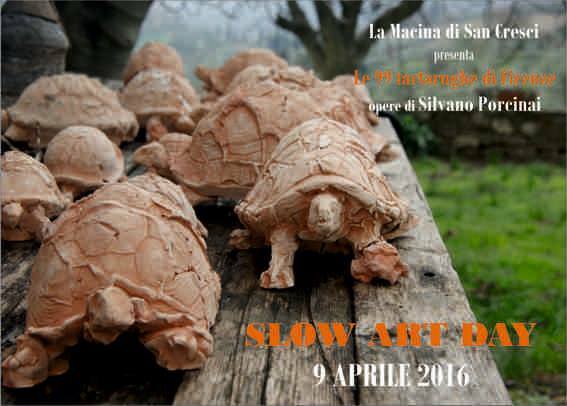 It is around the idea of this animal and its place in the collective imagination that La Macina di San Cresci has designed its Slow Art Day 2016: “The 99 Turtles of Florence,” an installation of 99 works in terracotta by the noted Florentine sculptor, Silvano Porcinai. The installation is inspired by a true story: the rescue of 99 turtles from the fountains of Florence, and their transfer to two tanks at the Cascine Park, pending their placement in an appropriate environment. The turtles, in this case marine, had been discussed and debated from the point of view of natural balance, security, education against the abandonment of animals by people who should care for them, and also these animals’ great strength and adaptability to the environment. Hence the sculptor’s choice to create 99 pieces. We may therefore say that the 99 marine turtles of Florence become at La Macina di San Cresci, for the Slow Art Day, the 99 land turtles by Silvano Porcinai. The 99 turtles will be a limited edition, handmade in terracotta by the artist, different from each other in shape and size, but the idea is that the installation last only a few hours; the intent is that they should be around, that someone will take care — as has happened for the 99 turtles of Florence — so that they can inspire, suggest, provoke new emotions, insights and thoughts in those who take them away. Silvano Porcinai was born in 1950 in Grassina, near Florence. He was graduated from the Art Institute of Florence and was later a professor of sculpture at art schools and institutes of Tuscany. His work has been shown in numerous solo and group exhibitions in Italy and abroad. His most recent artwork is a Pinocchio bronze in Kyoto, Japan.